Exodus 25:9 According to all that I shew thee, [after] the pattern of the tabernacle, and the pattern of the instruments thereof, even so shall ye make [it]. 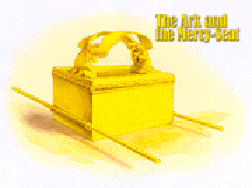 - The earthly tabernacle is a picture of the heavenly tabernacle. The Tabernacle is a picture of Christ and His ministry. In fact, the total Christian experience is wrapped up in the Tabernacle, the furniture, the way and why the Tabernacle was constructed. The purpose of the Tabernacle was to be a dwelling place for God among men. The Tabernacle was fenced off. God resided in the holy of holies at the back of the Tabernacle. He could only come into the presence of the high priest (one man only) who entered with blood once a year. There was still a lot of separation between man and God. The priests were set apart from the masses. The Levites didn't do the services. The families of Moses and Aaron did. They are of Levi, but are more separated than the rest of the tribe. Moses has seen the Tabernacle (a replica of it, in the 3rd heaven) before he even built it. 'pattern' - this Tabernacle is patterned after the one in heaven. Moses saw the original Tabernacle on the mount and than built the earthly one. 'better' ? The earthly Tabernacle was dedicated with the blood of bulls and goats, the heavenly Tabernacle with the blood of God. God won't accept any blood but that of a righteous man in the heavenly Tabernacle. 'entered' - Christ couldn't enter the earthly Tabernacle. He wasn't a Levitical priest. He was a Melchizedecian priest, an eternal priesthood, so He could only effectively enter an eternal Tabernacle: the heavenly Tabernacle. The Tabernacle foreshadows Christ's work, His ministry ? the purpose being to bring you into the proper relationship with God. 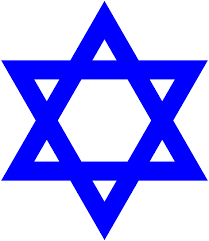 An argument that Jesus Christ is the Jewish Messiah. Uses Scripture of the 1917 Jewish Publication Society Hebrew-English Bible, Jewish sages, Talmud, Zohar and scientific evidence. An important way of looking at the Bible in a dispensational context is presented. Directed at the non-believer. Uses a wealth of scientific evidence to state its case. World history throughout the ages and Bible history are shown to be one and the same. The purpose behind our history is shown to directly correlate with God’s overall plan for man, the earth and the entire universe. Advocates that the 66 chapters of book of Isaiah draw much of their phraseology and substance from the 39 books of the Old Covenant and the 27 books of the New Covenant. A detailed computer analysis of the Bible along with a commentary on Isaiah is used to support this claim. Verses are compared and a scale of weights is applied to the findings to rate their context and relative significance. Reveals the correct truth about these little known and misunderstood kingdoms. Only by rightly dividing the Bible can the real truth about the kingdoms be realized. It is a fascinating story, one that started before our earth was created and whose ramifications will be felt throughout the entire universe for all eternity. Knowing about Bible chronology helps in understanding what God said and did at a particular time. Sometimes it can also help in understanding the relationship of Bible events to other historical events. The Bible itself provides the unit of its own chronology. Virtually all attempts by human chronologers to obtain an accurate Bible chronology without first understanding the Scriptures and praying over them have only resulted in inaccuracy. For example, there is no foundation for Ussher's date of the Creaion at 4004 BC. When was the exact date of the Exodus? When was Christ born? 'Guesswork' and theories employed by Man can be eliminated by a accurate understanding of Bible Chronology as it is implemented in the Scriptures. The Psalms draw on many aspects of the entire Bible. They have historical, prophetic and practical aspects. We are commanded to use the Psalms for singing and teaching (Ephesians 5:19, Colossians 3:16). They are referenced by Jesus Christ (Luke 24:44-47) and by the apostles (Acts 2:25-28). Music, in general, should be used to praise and worship God (See my music study for more). The Psalms cover the entire range of human feelings and emotions. They reveal David's fears, longings, doubts, hopes, joys and sorrows. They provide an inspired book for worship, which can be said to be praise of God Himself and satisfaction with Him. The Psalms also provide much prophecy. At least 16 Psalms contain prophecies concerning Jesus Christ. Additionally, Israel's past, present and future are portrayed. It is not unusual for a Psalm to reveal the millennial reign of the Messiah. The Psalms also tell of the experiences and the fate of the wicked. The thoughts of the wicked, the manner of life of the wicked, their hatred of saints and their final end are all covered. The Psalms are the hymns of Israel and they can be personal hymns, as well. All material is based on The King James Bible AV 1611. Please see bottom of this page to order hard copies of these books and for site contact information. To view any book - Left click on the link of the book to read the book in your browser. To save any book - Right click on the link of the book - "Save Target As...") to download. View - If your browser opens a 'Reading Untagged Document' dialog box just click 'Cancel'. in Acrobat PDF format (1498738 bytes). in Acrobat PDF format (2136834 bytes). in Acrobat PDF format (103919725 bytes). 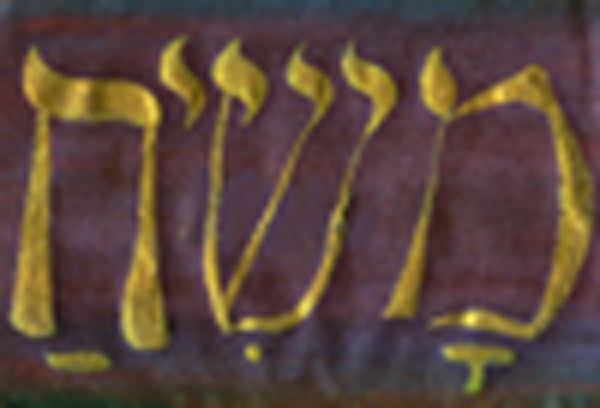 "Isaiah: a bible within the Bible"
in Acrobat PDF format (2682326 bytes). and the Kingdom of Heaven"
in Acrobat PDF format (504690 bytes). As it is Implemented in the Scriptures"
in Acrobat PDF format (23472258 bytes). *Note: Due to the highly graphical nature of this section please allow up to several minutes to download! Please be patient. You can read part while the rest loads. Select this link only when using a broadband connection. Read posted email answered by www.knowyourmessiah.com. Read replies to your email from other readers. The answers to questions you may have might be found in this discussion area. When the priest went out of the Tabernacle he became exposed to the sinner that came through the gate with a lamb. The priest did the sacrificing of the lamb - a picture of salvation by grace not by works. God had given the lamb life, food, sunshine. Then the priest was to minister to the man. John 6:51 I am the living bread, which came down from heaven: if any man eat of this bread, he shall live for ever: and the bread that I will give is my flesh, which I will give for the life of the world. Each of the 12 breads represented one of the 12 tribes of Israel. The priests were entitled to eat old loaves only while standing. The priests joined together for the fellowship of eating bread and becoming one. Just as the table of Shewbread pictures fellowship and communion, it points to Christ, who offered better promises for us to partake in that we might all be one in the Spirit. While Manna pictures Life Given (John 6:32-33), Shewbread pictures Life Sustained (Romans 5:10).. The veil is present in the earthly tabernacle because the atonement was not yet complete. When Christ died the veil was rent. The veil showed that the relationship between man and God was incomplete under the first covenant but we can now enter into the presence of God through the flesh (blood) of Christ and dwell with God. The rent veil ended the earthly priesthood. The Tabernacle was walled; it excluded everybody. It taught exclusion from the presence and fellowship of God. The first thing that happened when you went through the door of the Tabernacle was a blood sacrifice. This was where God and man reconciled. Without the shedding of blood there is no remission of sins. 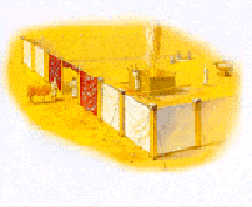 The Tabernacle was divided by the veil, into the Holy Place and the Holy of Holies. The priests served in the Holy Place. It represents the church of Christ. The Holy of Holies represented God¡¯s special dwelling place on the Earth in the midst of His people. It was a perfect cube in shape, a type of the Holy City of New Jerusalem. As with the Table of Shewbread, the Altar of Incense had a golden crown on top of it. 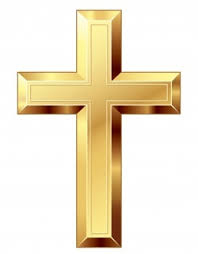 This signifies Christ being crowned with glory and honour (Hebrews 2:9). 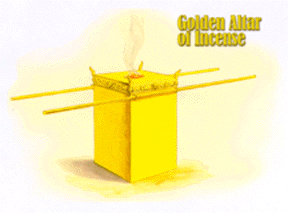 Incense is a type of the true prayers of the believer through Christ. As high priest according to the order of Melchisedek He presents incense to the Father (Romans 8:34, Hebrews 7:25). One of the ingredients of the incense was salt, added to keep our prayer neither sentimental nor formal. The Tabernacle proper also contains the Altar of Brass (See above) in the outer coutyard for sarificing aninals. The Altar of Insence was inside the Tabernacle in front of the veil. As a general rule the inner furnishings represent the work Christ does for us in heaven in the presence of God, while the furnishings in the outer courtyard represent the work done for us on this Earth in the presence of man. 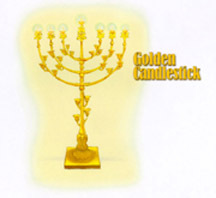 The Candlestick was made of hammered gold and consisted of a main branch from which 6 other branches protruded. The lamps were fed with pure olive oil and they burned all night. Oil is a type of the Holy Spirit. The lamps were fashioned like Almonds. Almonds speak of the resurrection. The almond tree is the first tree to bear fruit in the spring. There was a clear connection between the lampstand and the Holy of Holies in that the appearance of the lampstand resembled the rod of Aaron, which budded (see Numbers 17), that was behind the veil. 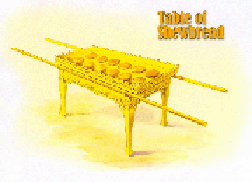 But the prominent connection was with the Table of Shewbread because the Lampstand was particularly designed to illuminate the Table. The word "laver" means a bath or wash-basin containing water for the purpose of washing. The Jewish priests had to wash their hands and feet before entering the Tabernacle. They were commanded to continually wash their hands and feet during service. Each time the priest went past the Brazen Laver he was to wash, whether he was coming or going. After the priest performed the sacrifice he would look at his reflection in the Laver. Washing himself typified the washing of the body in the blood of Christ, cleansing his body and conscience by the word of God (See Ephesians 5:26). The Laver also pictures Sanctification. It also pictures the Word of God. As the Word of God is infinite, no exact size is given for the laver in the instructions for building the Tabernacle. Click here for more of the Tabernacle overview. Under construction - but you can email your requests to the address below. You are welcome to comment on the material. Feedback is encouraged, both positive and negative. An attempt will be made to respond to all relevant comments. Responses will selectively be posted on this site. You may reply to email from other readers that is posted on this site. You may reply to the answers supplied by www.knowyourmessiah.com that are posted on this site.